113424 visits since Jan. 2007. Mollusc species inhabit different areas of the sea shore. 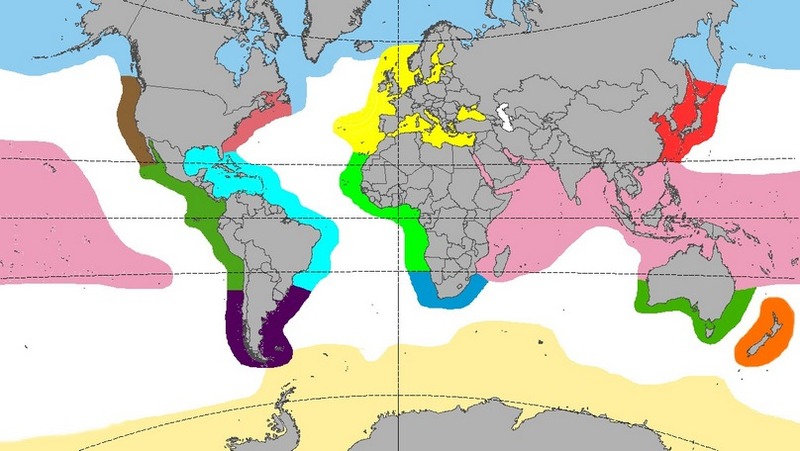 Some adaptations allow a few species to live high above the sea level, they are in the supralittoral area. Most of them must live underwater, they live in the infralittoral area. Some of them prefer to mix living environment and choose to dwell in the area between the high tides and the low tides, that area is the littoral (s.s.) and is sometime called the intertidal zone. The figure below illustrates theses areas where species spread vertically. Most of molluscs species are located into one malacological province. A province is defined as a large and continuous piece of water in which the oceanographic parameters are similar enough. Consequently, a province is inhabited by specific mollusc species. They are specific of that province and only of that one. Theorically, it is possible to divide the oceans into a crowd of small provinces from the point of view of one specie. For example if we can find specie X only into the English Channel, we would be tempted to turn the English Channel into a province. But let us adopt the reverse point of view: if we can find another specie Y into the Baltic Sea and also into the Mediterranean Sea then the two places belongs to the same province. Doing so, and extending the range of a maximum of specie, only a few provinces can be separated over the world. They are shown on the map below. Approximative distribution of the malagological provinces over the world oceans. Note that the provinces distribution is really linked to the latitudes (a group of tropical provinces is locked between the two tropics, another group exists under the Capricorn's and an other occurs north of Cancer's). In deed, sea temperature and sun enlightement are strong separating factors to define those provinces. The province concept fades off if we are looking deeper into the ocean. When a certain depth is reached, the oceanographic conditions tend to be the same under any latitude. We might then be able to define a global "abyssal" province. Some species do not belong to only one province, they are scattered worldwide. The reasons of this are either natural or anthropic. An example of a worldwide mollusc is Spirula spirula, it is a cephalopod specie that occurs in all tropical oceans. Men have carried some species from a province to another by accident or on purpose (this the case of certain cultivated shells like Crassostrea gigas or Mytilus edulis).